People use to that I keep bitching about electricity. Practically anyone who developed playback to a more or less capable level and who has ears know that quality of electricity hugely affects sound. I personally do not fight with electricity - I defeated its victory. When the electricity is good then it sound fine but when the electricity bad then the only suitable course of actions it to shut down the system... or completely disconnect from grid. When the electricity is bad then none of the known to me methods help…. Couple days ago a guy that I know and I decided to make an experiment with reels transfers and I was trying to record something to my tape recorder from CD. The CD that I was recorded was very “clean” and very high quietly. However, when I put the headphones on and put the recorder to “record” then I heard hugely distorted sound when each single pitch was surrounded with a cloud of gray fog and HF ringing. I thought that something got broken with my Stellavox and was very upset but then I pull the PS off the Stellavox and went to drive Stellavox from butteries. Alleluia! All noise is gone and sound got instantaneously cleaned…. Probably next time I need to do recording with Stellavox connected to grid and discounted and post it on my site…. What the hell of ugliness!!! Here is how I envision the graphical associative presentation of sound. First one with good electricity and second with bad. Re: It’s mad, mad, mad... electricity. If you could put up with the manic hassle of recharging and the sheer space required by the cells, you could go 100% battery - or maybe go filtered mains for the tube heaters. I was thinking to put my Bidat on DC many times but Bidat in order to sound OK should be well warmed, with 12 more then hour under the belt… so how beneficial would be to switch to DC? Perhaps a good idea would be keep it running all time from AC and then switch to DC only during the listening… However, since I’m experimenting with a new DAC now, that one that runs very hot and eats a LOT of juice I think the buttery powered Bidat project is on the very back burners for now…. The problem in here is that we stick with intellectual and logical justification of what “might” work. Yes, the own regeneration should be good. Yes, the buttery powering should be good. But as you begin to actually try and if you really concerned about the actual Sonic results instead of subordination of your senses to the goal of justification the abstract concerts then you might observe that the results of you deeds are not as exiting as you would like them to be. However it is not the only problem with your deed but it very much might be too bogus or juts too faulty concerts. Well, if those people are not intelligent enough to understand that there is nothing subjective in subjective perception then do they have any reasons to make a properly sounding DAC? There are many folks out there who have electrician education and who have fluently operates by the notions of bits, volts or Hzs. However it is not enough to make Sound. There are many folks who design their DACs for satisfaction of their oscilloscope and this why this DACs all sound like crap. It is the very same with power lines – none of the freaks that I have seen who made the power treatment devises talks about Sound. None of their products (at least those that I tried) works as they should – they mask out the narrow problem but screw the Global Sound. I am sure that those “no subjective perception” Lithuania guys are sitting in the same very shallow boat. I believe this system was actually developed for people living in parts of the world where the electricity supply is truly terrible, in the first instance a customer living in a more remote part of Thailand. I believe that the number of batteries used can easily be increased. I believe the amplifiers the guy in Thailand used were actually some of the larger Jadis designs and the system he has runs these amps and his other equipment from a small hut built next to the house. My own exposure to this includes listening to it at a show and at the manufacturers place. On both occasions the music produced by the system made more sense to me when the mains supply was decoupled. Where I live, I think the mains supply is ok. No large towns or heavy industry nearby. I doubt the effect would be so pronounced. I'm always amused by your concern regarding everyone else's ability to discern what might or might not achieve a successful result in the pursuit of good sound. It's remarkable given their limited criteria and comparitively barbarian methods for evaluating their results, that engineers at the BBC, your local radio station and at companies such as Koetsu, Ortofon, Revox, Neumann, DG, EMI, etc etc just occasionally manage not to screw things up. Pure luck I suppose. Holly Cow! I’m, perhaps, an electrical genius! *** I'm always amused by your concern regarding everyone else's ability to discern what might or might not achieve a successful result in the pursuit of good sound. It's remarkable given their limited criteria and comparitively barbarian methods for evaluating their results, that engineers at the BBC, your local radio station and at companies such as Koetsu, Ortofon, Revox, Neumann, DG, EMI, etc etc just occasionally manage not to screw things up. Pure luck I suppose. I would agree with you. Mostly it is because the pure luck and because the moronic faulty knowledge that dominates awareness of the today’s engineers was not developed or did not managed to penetrate the engineering masses deep enough. Also, no one would tell you how good those Neumanns or Ortofon were compare to how they could be…. Returning back to the subject…. While I was writing my last biting post a revelation stroke me how to resolve the electricity problems. I think I have invented a methodology according to which ALL problems with electricity should be resolved by the very nature of THE method. It is VERY different with whatever currently is being used and I am very excited to run it with my technical folks and to learn if it migh be implementable. Re: Holly Cow! I’m, perhaps, an electrical genius! Returning back to the subject…. While I was writing my last biting post a revelation stroke me how to resolve the electricity problems. I think I have invented a methodology according to which ALL problems with electricity should be resolved by the very nature of THE method. It is VERY different with whatever currently is being used and I am very excited to run it with my technical folks and to learn if it implementable. I have an idea as well. Drop me a line. The celebration of my optimism over Reality? Yes, the dream is that someone will somehow come up with something that works on amplifiers. But right now I'd be happy for something that worked on my phonostage! How hard can that be??? Hell, I've gone so far as to take my pre-amp off the grid! Why wouldn't a big, whole-house-sized transformer do it? Why is this such a damned mystery? For one thing, I am pretty convinced that each component screws up the other ones and that this problem is exacerbated exponentially on "Bad Power" days. I think much of the marketing of this stuff is aimed at HT now. Reading about the sensitivity of your system to electrical power supply problems reminds me of the days when I used to make my own equipment as much for the learning experience as for the final result. One of the mundane things I learned is that standard audio equipment, including shielded cable connections, did not (and possibly still does not) follow good GROUNDING practice. You connect the stuff in the usual way and you are bound for problems. The sensitivity of your low-level equipment, the success of using battery supplies on some sources and the inability of line filters and conditioners to alleviate the problems without causing other problems suggests that you might look again at the grounding in your system. Remember, a grounding problem does not always result in hum or any noise in the absence of signal. Grounding problems are dynamic and disturb the signal and so can masquerade as or exacerbate a power supply problem. 1) Cable shields should be grounded at only ONE END, otherwise you are providing multiple ground connections between pieces of equipment. 2) The single cable shield connection should be connected to the internal central ground point by wire not by chassis. Usually, the cable shields must be disconnected at one device's connector. 3) Sometimes, one cable shield of a stereo pair is connected at both ends to make the ground connection between devices but this is not as desirable as a single separate wire for grounding each device to an external central ground (STAR grounding instead of cascaded grounding). Remember a cable shield is intended to reduce noise, not carry signal or ground. 4) The system as a whole should be carefully grounded. Sometimes household grounds are inferior and a high-quality separate connection to a good outside ground is needed (a subject in itself). 5) You may have a stray voltage problem. 6) Your audio system might benefit from a dedicated power line, isolated from other household appliances. 7) If you live in an apartment building consider moving. Grounding, so basic and simple, can be a subtle and tricky thing. It is important but cannot be perfect and therefore always suspect. The more problems that involve the low-level equipment the more I would suspect faulty grounding and shielding at least as a contributing factor. It should be obvious that the more extensive the system the more likely the problems. On the other hand, where grounding turns out not to be much of a problem, I wonder if the new high voltage battery technology used in hybrid cars might be useful at least for the true audio obsessive. You might be right thought whatever I know on subject suggests that the problem is not related to grounding. I would invite your apparent expertise to asses what it going on. My entire playback is all single ended. The playback is powered from 3 dedicated 8ga 20A each lines taken as close to the “street” and the “code” allowed me. Do not use the household grounds for years with my playback. In fact the 3 dedicated power line do not even grounded to the common grid’s ground. I have my own ground – 10 feet 5/8 cupper poll driven in backyard’s, in the electrically fertilized soul (at the time what it was driven in). From the grounding poll I have 12ga cable running to the grounding terminal of my preamp. I did not measure the grounding impedance but I think that it should be marginally low. I did not do it recently but a few years ago I checked the AC polarity on all elements of my playback and made sure that they all where in phase. There are no (known to me) loops in the systems. There are few sources that are not connected to the dedicated audio lines and plugged juts to the ground lifted household lines: motor of my TT, the logic section of my preamp and etc… None of them have any electrical or grounding contacts with signal path. Now is the freaky part. The effect of grounding in my entire playact is absolutely not auditable. I checked it when electricity was good or bad – it was irrelevant to Sound and to noises. What I meant - the connection or disconnection of the main ground of my playback had absolutely no auditable affect of any kind. In fact I am known to run my playback sometimes in complete lifted mode, with no reference to ground at all. It is not a good or secure idea but I had my rational sometimes (current bios of the cables and so on…) In fact I had once running my entire playback at 220V with reference to 120V on lifted ground – there was no effect to sound as well. Well, my research of the subject leaded me to talk with their distributor. He turned out to be very much clueless and loaded me with a pile of incredible BS. I spoke with the guy at the manufacturing faculty. From my point of view allow they were not very equipped to deal with customers if a customer demands a little more then just generic bumper-sticker audio-phraseology of audio publications. They peaty much paraphrased to me their reviews with inability to say anything more. I do not know if the APS PurePower unit is “better”, if it should be the case then it’s will not be by design – it is a regular regenerator as any other. I kind of liked what the PurePower’s Richard told me – he said that he feels that it sound different then from what I accustomed to get from generators. (It sounded to me that he had no idea know why – which is perfectly fine to me). With all of it there is one undeniable positive fact that PurePower does – a free home trial – the way how it should be. It sets a very right prospect to try the PurePower unit.. I am intend to order this re-generator from PurePower, who knows perhaps, even if accidentally, something might be useable in the world of power re-regenerators. Lots of good thoughts about grounding; thanks. But I am still left wondering how the same connections can sound great on one occasion and terrible the next. Like Romy, I ground my gear to a dedicated rod driven near the gear because the house/grid ground is audibly (and measurably) "dirty". Also, I have encountered the same intermittant problems with dedicated circuits pulled from a dedicated sub panel where the ground bus is separate from the neutral bus, along with the same careful grounding schemes. 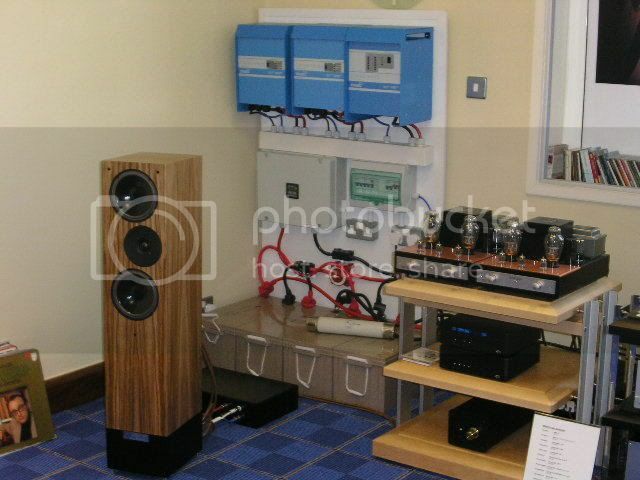 I am no expert on batteries, and I have encountered no one who is seriously informed about batteries as they relate to powering evolved hi-fi, which is plainly a different proposition than just getting the amps and voltage "to spec" electrically. In my limited experience batteries have been a trade-off, less line noise but also less color, etc., seeming to drain some life from the music. I agree, however, that the "background silence" can be breathtaking, and I still want to explore using batteries for filaments only. Another thing that tweaks my brain is how some "super-regulated" gear is just so devoid of life. I do not pretend to know why any "extra" amount of regulation should sound "worse", since I would tend to think that just the opposite would be true. The Hell of it is that the "better" my system sounds when everything is "right", the worse it sounds when things go "wrong". Right now, the Power Company has me by the short hairs. Wet ground or dry ground? Many years ago, when I worked for Mille Nestorovik he used seperate mains and a sperate ground connection for the entire system. Before turning it on for a listening session, he would send me outside to "water" the ground, for a good half hour and about 4 meters around the ground pole. This pole was replaced every two years due to cupric oxide corrosion, a dark red color to the bare copper. The connecting cable was replaced at the same time. A dry ground to a wet ground was audible. A new post and cable was audible, but I have no idea how long it remained so. I am no power expert but here are my observations on your situation. Even though a PS Audio and others create a perfect AC sine wave this does not seem to be the answer, even for low draw front end components. It seems that some type of problem is still coming through. Each component will have a different sensitivity to the noise, amplitude and frequency dependent. Using a one size fits all filter at the head of the system will probably create more problems than in will solve in your situation. Plus when the power is fine the box will probably corrupt your delicately balanced sound. So what I think you need are individual adjustable filters for each component at the IEC inlet. Some components might be immune to bad power and others might need only minor help. When the power is particularly bad you might need more correction and need to use filters on all components vs. moderately bad days when you might need light filtration on only a few units. Plus you need to be able to bypass the filters when power is good. I don't know anything about building the filters but the concept of inductors and/or LCR doesn't seem overly difficult compared to what else you have done. If you make a successful design you could probably become rich. The other thing that should be considered is that part of the problem might be airbourne RFI which must be changing during the day. Filters on the inlet IECs I think still solve the problem but we can no longer blame the power company. Airbourne pollution would also explain why regenerators do not work perfectly. I don't know if this is the same thing, but when I had my Lamm LP2 phono stage I was constantly annoyed at how quiet it was. Record noise disappeared but not in a good sense. My guess, probably wrong, is that the Lamm had excessive AC filtration and nothing I did could be bring the sound back (except get a new phono stage). I'm thinking that with more and more AC problems that manufacturers are adding stronger and stronger AC filters, which will help most people but cause deficiencies for others. ASP, Lamm, mains and the unknown casualty. George, you not need to tell me about it. In the past I have the entire system lifter on PowerPlants (4 PP300 on ML2 and one of PP3000 front end) I know very well that they do not work as they should. Good points and I have thought about it. The ASP unit that I will be trying doe has a bypass. 1) The APS unit is the real God-send thing the does properly decouples the load from the mains. 4) The APS guy juts lie. Well, will see what happens…. A message I posted at PS Audio Forums that was deleted. Paul, I have a question to ask: what are the SONICALLY BENEFICIAL DIFFERENCE between your old PowerPlants and your new Premier units? I would not ask you to enumerate the factual taking points well descried in the products information on your site: the new amplifiers, efficiency, power and a number of other things are obvious and are self-explanatory. What I would like you to do is disregard the new amplifiers, efficiency, and bypasses and to express what you feel is deferent in the Premier that from your point of view should make the Premier SONICLY different then the old PowerPlants. I did own Power Plants and used them in quite different application: I should confess that they, although did what they intended to do, but they did not do what I need them to do and despite being regenerators they still were transparent to bad electricity, compression and noises, not to mention that PowerPlants objectively had own Sound. So, if you do not mind, I would like to ask you to answer to the following format. 1) What technical (design, circuitry, topological, generator) differences between PowerPlants and Premier that you feel should have SONIC IMPACT? 2) What you personally feel is the subjective difference between the sonic performance of PowerPlants and Premier? 3) When electricity is very good and you run playback from Premier vs. in bypass mode then what differences in Sound you might name? 4) What you feel differentiate performance of your Premier from your competitor (who do full regeneration) or from $7K-$9K commercial regenerator units? Paul, I ask you because I am considering your unit, along with the simple units of some of your competitors. You guys sell honest – offering in home trial period – but frankly if your new Premier is just a “Class D” irradiation of the PowerPlants then I would not waste your company time and mine time to try it. (I owned 5 PowerPlants). I would also prefer to head the information from you instead to read about it among the doodles of some idiot-reviewer who, I am sure, will drool stupid saliva about your products in near future.